It's not often that a famous Broadway producer takes the time to write a note to Nigel Travis, Dunkin' Brands CEO and Dunkin' Donuts President, U.S. 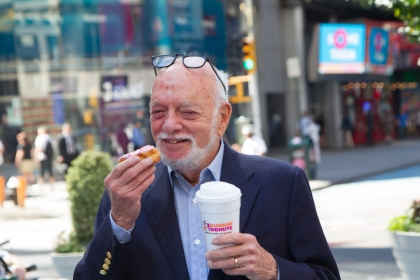 However, that's exactly what happened when Harold "Hal" Prince, a 21-time Tony Award winner and huge Dunkin’ fan, noticed our static billboard amid the bright neon lights and digital billboards of Times Square. Little did Hal know that the DD marketing team already had plans for a new digital billboard in the works! 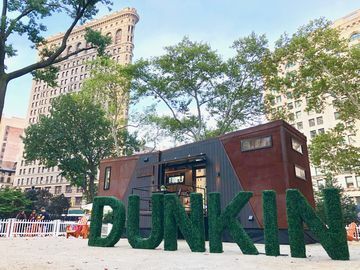 Inspired by Hal’s letter, Nigel Travis, Dunkin' Brands CEO and Dunkin' Donuts President, U.S., and John Costello, Dunkin’ Brands’ Chief Global Marketing and Innovation Officer, invited him to unveil Dunkin’ Donuts’ new digital billboard in Times Square on June 1, National Donut Day. The Dunkin’ Donuts team, which included Nigel Travis, John Costello and a group of New York City area franchisees and employees, were all thrilled to welcome Prince to the team for the day as they gathered at NASDAQ to participate in an Opening Bell ceremony. The ceremony was broadcast live in Times Square on NASDAQ’s billboard, which had been re-branded “NASDDAQ,” with pink and orange “D’s” to commemorate the occasion. Following the ceremony, Hal joined the Dunkin’ Donuts team outside to take in the new digital billboard. Located at One Times Square, the new interactive billboard is a great addition to NYC’s most famous neighborhood. 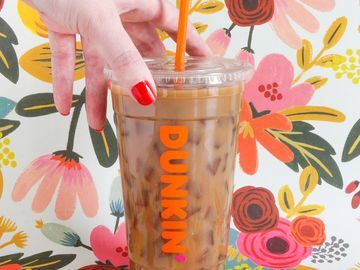 Aside from mouth-watering product images of donuts, coffee and more, Dunkin’ Donuts fans can also check into the new billboard on Foursquare, or send @DunkinDonuts a tweet with one of the “trenDDing” hashtags. 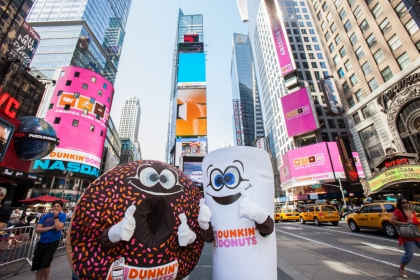 The billboard also takes Dunkin’ Donuts’ popular Facebook Fan of the Week program to new heights by broadcasting their submitted images to all of Times Square! KinDD of a big deal! 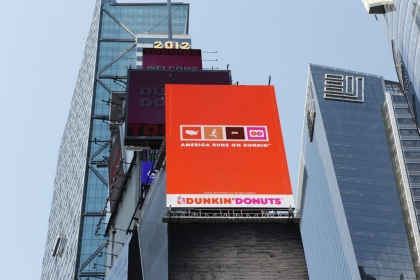 Upon viewing the new digital billboard, Prince declared it “a knockout.” Among featured Dunkin’ Donuts content, the board also features promotions for Prince’s upcoming musical, Prince of Broadway. The story of Prince’s incredible career will be coming to the stage this fall in 2013. We were thrilled to have a Broadway legend show his support for Dunkin’ and we can’t wait to see how our new sign changes the face of Times Square! Two thumbs up from Cuppy and Mr. Sprinkles on National Donut Day! 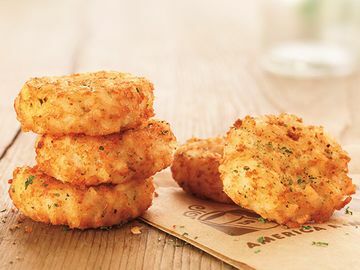 Have you seen DD’s new digital billboard? What do you think? Don’t forget to share your unique photos on our Facebook page for your chance to appear on the screen in Times Square!